Frequently Asked Questions | FFPM – Fédération Française des Pilotes Maritimes. What is a maritime pilot? A pilot is a mariner adviser who guides a ship through dangerous waters, fairways, harbours and river approaches. His role is to assist the master by bringing local expertise, and pieces of advice during the ship’s passage at arrival, anchorage, or departure. The pilots provide a local knowledge to make the passage of the ship safe, and to protect the environment. They have an overall review of local regulations, port activities, customs of the harbour and effect of the current or sounding. Also, they provide communications with port authorities, Vessel Trafic System, tugs, and other piloted ships. What exactly is the intervention of a maritime pilot? Guiding ships at the entrance and exit of ports. Shiphandling, berthing and undocking operations of these ships. Providing , and coordinating the response of all actors in these ship’s handling (Ports Authorities, tugs, linesmen, trafic regulation…). Pilotage is one of the oldest, and least-known maritime profession, but it is one of the most important link in maritime safety. Nowadays, the actual economic and environmental risks, involving large ships, make the role of the pilot really essential. By Assisting ships in ports, pilots contribute to the safety, to the safety of life at sea, to the safe passage in ports, and by the way, protect the environment and improve the fluidity of the trafic in the port area, therefore pilot is really engaged in the economic competitivity of the port. How can you become a maritime pilot? Basically, all maritime pilots are merchant navy officers. To be qualified to become a maritime pilot, one of the requirements is to have sailed and collected ten years sailing experience on various ships and positions on board. Then you have to prepare and pass a competition which is specific to each pilot station. Preparing this examination consist in learning all the features of the geographical area covered by the pilotage and to know the pratice of shiphandling in this area. The new maritime pilot will be in training with other experienced maritime pilot of the station for 5 years. At the end he will be able to manoeuver all types of ships in the pilot station area. Why passing an exam is compulsory to be able to drive a ship in a port environment, whereas it’s supposed to be one of the master’s missions? 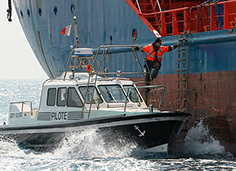 Pilotage is one of the most important link in maritime safety. Nowadays, the actual economic and environmental risks, involving large ships, make the role of the pilot really essential. Captain does not be able to know all the specificities and dangers of ports they frequent. 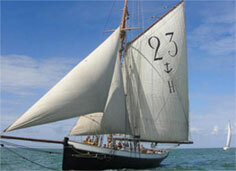 The maritime pilot is an expert of a specific geographical area and specialist in shiphandling. Pilotage is widely compulsory, each state being entitled to define the limit of ships which need to be piloted. Most maritime countries have areas designated as compulsory pilotage districts where ships are not allowed to navigate unless licensed pilot. The reason of such a decision is based on the needs of national public interest, keeping the safety level and environment protection at his maximum. There may be some exceptions according to local regulation : very small ships, regulars users of the ports . Is there different types of maritime pilots ? All maritime pilots are merchant navy officers. They have all sailed a lot on all types of vessels with various positions on board (deck, machine, bridge …). So there is no difference between pilots concerning their training. However a maritime pilot is always attached to a pilot station, belonged to a very specific geographic area. Two Maritime pilots working in a same pilot station are interchangeable, while two maritime pilots involved in different pilot stations, are not. Could a port be closed , particularly in case of very bad weather ? The ports may be closed for various reasons (including bad weather). The decision to close the port belongs to the port authority. The pilotage is never closed because it may be necessary to guide or assist a vessel, such a vessel in difficulty, near a port whose access is closed. However a maritime pilot may decide to refuse to handle a ship if the safety warranties to enter or leave a port in good safety conditions are not granted. Sometimes a port can be closed only for entry, in that case the maritime pilot must stay on the outbound ship, until the next possible point of disembarkation. 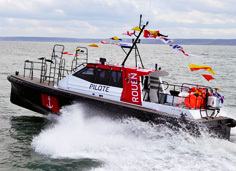 Is Pilotage a private or public service? In order to exercise their functions, contributing to the safety of the ship’s passage and protection of environment, pilots are self-employed, and organized as independant economic entities, grouping together in association, private organizations, created by and always subject to the government control. The reason of such a decision is based on the needs of national public interest, keeping the safety level and environment protection at his maximum. This public interest mission is costless for citizen, for civil taxpayers.